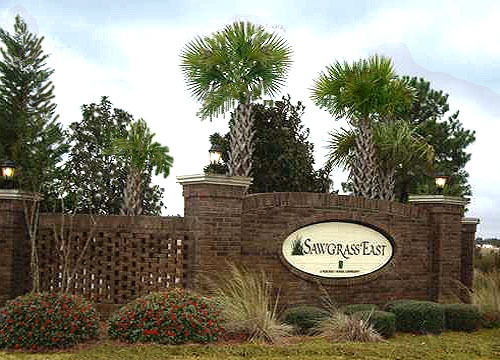 Sawgrass East is a beautiful community of quiet, quaint townhomes centrally located in the master-planned community of Carolina Forest. It is within a mile of schools and offers wooded and lake view lots. A community clubhouse and pool. 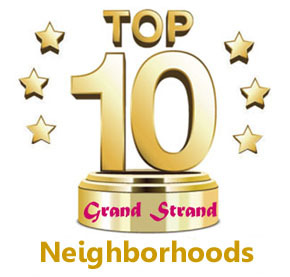 along with many walking and biking trails make this the perfect inexpensive family neighborhood, and the homes are very popular. Built in 2006, Sawgrass East townhomes are two-story, 2 and 3 bedroom homes priced from under $100,000 up to about $140,000 respectively. 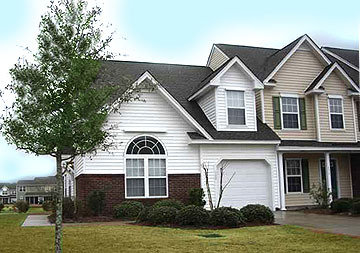 This is a great value for the type of home and neighborhood, and being outside the city limits of Myrtle Beach means lower taxes as well. Homes have covered porches in the front or back - or sometimes both. The back opens into a fenced patio area. Designed as a perfect cross between a condo and a home, mortgage companies treat townhomes the same as single-family homes, without the condominium restrictions. If you'd like to see some of these unique Sawgrass East town houses for sale, give us a call. We'll be glad to take you on a tour. Listing courtesy of Real Living Home Realty Group , Alex Biello.